As a quality manager, you are constantly working on the HACCP guidelines for your sector. Food safety is critical for your business. Proper implementation of the hygiene plan provides safety for employees and consumers. From an economic standpoint, you are also dependent on the correct implementation of the guidelines concerning general and personal hygiene. The resources that are purchased, such as units and devices, must meet certain conditions, so that you can maintain a high standard of hygiene. What should you pay attention to when purchasing equipment? There are various solutions that fit into the HACCP plan. In this blog, we talk specifically about personal hygiene. This requires more than just the right equipment, it also requires your employees to conduct themselves in the right way. Elpress has more than 40 years of experience with applications relating to general and personal hygiene. We would be happy to share our insights with you and let you know what to look out for when purchasing equipment and other resources. Take a good look at what is needed and what works within your company. How to employees move around during the lunch break or when the shifts change? What is a practical sequence for the units? How many people need to use them and how many pieces of a specific application are needed. An expert can work with you on this and advise you on the basis of his knowledge. Food safety depends entirely on the cleaning and disinfection units working properly. Second-hand appliances may seem attractive from a price perspective, but often turn out to be a bad investment. After all, you want to monitor quality, and continuity is also important. Should a unit be out of order, then you must be able to rely on the warranty, so that, for example, broken parts can be suitably replaced. In addition, new applications have been designed with sustainability in mind - they are energy-efficient, which pays for itself over time. Good personal hygiene cannot be left to applications alone; the correct use of those applications is at least as important. Go through the desired steps and actions with your staff. Give room for feedback, they know the situation on the ground better than anyone else. More information about purchasing HACCP products? Would you like more information about purchasing HACCP products that will help to improve personal hygiene in your company? 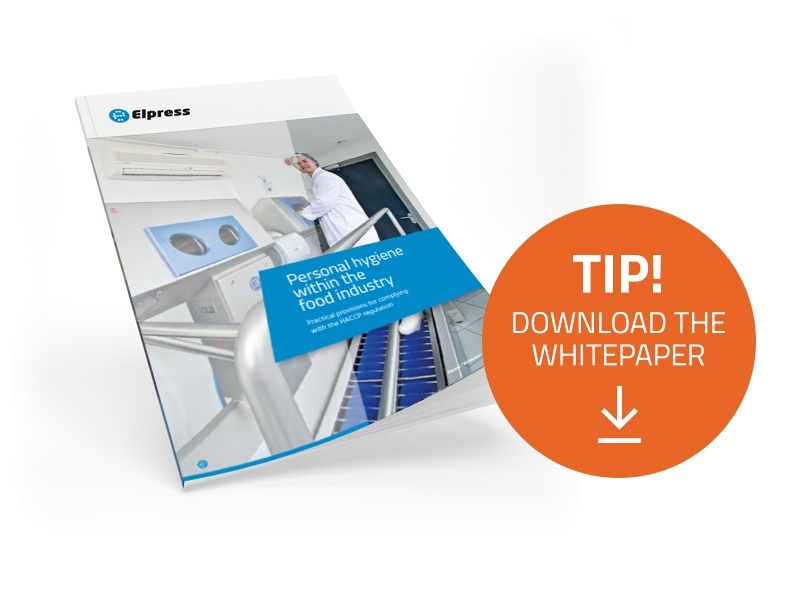 Then download our handy and clear white paper: ‘Personal hygiene within the food industry’.